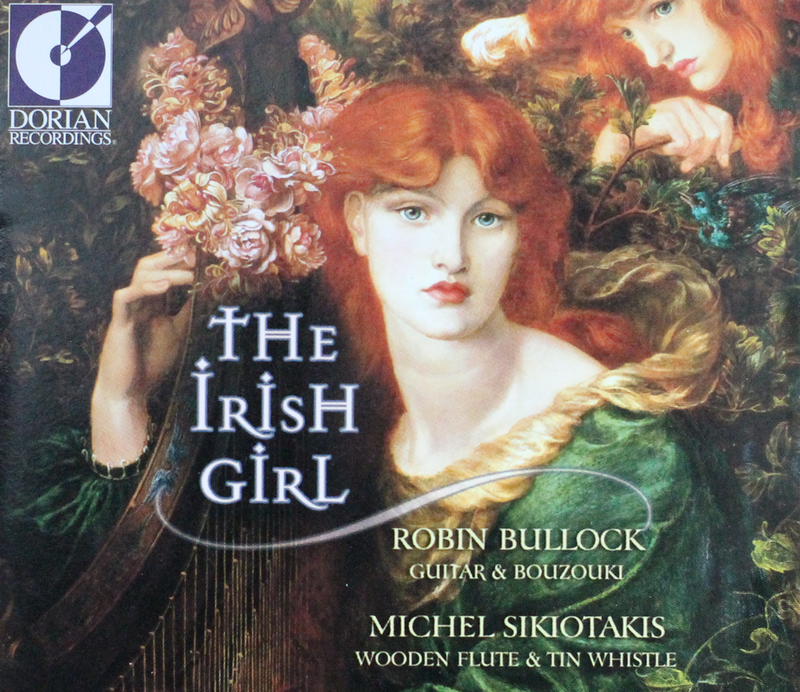 The debut recording of the transatlantic Irish duo of American multi-instrumentalist Robin Bullock and Parisian flute and whistle player Michel Sikiotakis, France's first All-Ireland whistle champion (whose virtuoso flight on “The Whistling Postman” must be heard to be believed). Pure drop Irish airs, jigs, reels and hornpipes lovingly rendered by two masters of the craft. Please note this selection is available via CDBaby only. Clicking the button below will take you to CD Baby’s website. The traditional Irish music scene, like traditional music scenes everywhere I suppose, is a complete universe and a very small village at the same time. The music is literally all over the world now, yet everybody involved in it seems to know everybody else, if not directly then by only a few degrees of separation. There’d be nothing surprising in an American guitarist meeting a French flute player in an Irish pub in Paris and discovering a natural chemistry – which is exactly what happened in 2000 at Connolly’s Corner on the Left Bank, the night I met Michel Sikiotakis. As soon as I heard him play, I realized that here was one of the genre’s finest flute and whistle players. He also knew a thing or two about the music, as I later found out – he’d traveled through Ireland recording great musicians (flute player Kevin Crawford, for one, well before he shot to fame with Lúnasa), he’d helped organize French concerts for the likes of the Chieftains, Altan and De Danann, and of course he’d won two All-Ireland championships, one as a member of his first group and one as a tin whistle soloist. Enter Dorian Recordings, et voilà. It’s an honor to join such a musician as Michel in a duo, and even more, to call him my friend. We offer you here a few tunes from our first couple of years of playing together, and we hope you enjoy them. We slow down the tempo for the next three reels. This set starts with “Collier’s,” a favourite reel with pipers. One day, Francis Doherty, a (French!) tin whistle student, brought me a tape he recorded on RTE, the Irish national radio. There was a reel played by a whistle player that he wanted to learn. Here’s that tune. I never found any information about it, so I call it “Francis Doherty’s.” “The Blockers” is a composition by fiddler Seán Ryan and figures in his book The Hidden Ireland. This feel is often played in D; I transposed it to the key of G to suite the flute, and realized afterward that that’s the original key as written in the book. “The Banks of the Moy” comes from the singing of Treasa Ní Cheanni, heard on Popular Traditional Songs, a cassette released a long time ago by CCE. Interestingly enough, Robin knew an almost identical melody from the singing of Doc Watson, who called it “Wake Up Little Maggie”! “Kitty Magennis,” a seldom-heard composition of the blind harper Turlough O’Carolan (1670-1738), appears in volume one of Donal O’Sullivan’s Carolan: The Life, Times and Music of an Irish Harper, under the section Tunes for Patrons. This track is dedicated to harp player Katrien Delavier, a great friend who sadly died much too young. John Brady, flute player from County Offaly, composed “The Twins’ Delight.” It can be found in his tune book. The second jig comes second in a set called “Paddy Taylor’s Jigs” on flute player Paddy Taylor’s LP issued by Claddagh (CC8). “O’Mahony’s” can be found on The Star Above the Garter – Fiddle Music from Kerry (Claddagh CC5), played by Denis Murphy and Julia Clifford. I probably learned that tune from fiddler player Olivier Darras, colleague in the band Shamrock. “Galway Bay” comes from the playing of the inimitable Joe Burke. This three-part version of “The Rocky Road to Dublin” comes from piper/folklorist Seamus Ennis. He recorded it on The Pure Dropin 1973 (Tara 1002) and a printed version appears in Ceol Rince na hÉireann Vol. 3, no. 58. I first heard “The Maid in the Cherry Tree” on another old CCE recording, this time of the Castle Ceili Band. This group included among others flute player Michael Tubridy, fiddler Seán Keane (both of Chieftains fame) and Seán Kelly Sr., also on fiddle. This tune is also known as “The Curragh Races.” While writing these notes and going back to this cassette, which I hadn’t heard for a long time, I realized “Boil the Breakfast Early” was actually part of the same set. Sorry boys for stealing your combination of tunes! I first heard “An Cailín Rua” (“The Red Haired Girl”) on Darby’s Farewell, an LP of outstanding flute, whistle and songs by Josie McDermott, recorded by Robin Morton for the Topic label in 1976. The first reel is a composition of East Galway fiddle player Paddy Fahy. John Stevenson is a mandolin player from the USA. “The Flight of the Eaglets” is a Highland bagpipes lament composed by pipe major William Ross. Also called “Lady MacRobert’s Lament,” it commemorates the loss of that lady’s three sons in World War II. “The Depth Charge” is a three-part jig composed by Robin. The title is a souvenir of his wilder days; a depth charge is a drink consisting of a shot glass of whiskey dropped (glass and all) into a pint of beer. “The Chanter’s Tune” is no. 147 in Bunting’s Ancient Music of Ireland and no. 143 in O’Neill’s Music of Ireland. It’s also sometimes known as “The Chanter’s Song.” The first jig is called by eight different names by Breathnach, but “The Maid at the Well” seems to be the most common name now. The version played here is the one most favoured by pipers. I don’t remember where I got this version of “The Frost is All Over.” One of those tunes that comes into my mind when I’m stuck for a tune. Two great fiddle tunes not commonly heard on the flute. The first one is by Ed Reavy and the second by Paddy Fahy. Thanks to John Weir for playing that first tune on fiddle at a memorable afternoon session in Miltown Malbay in 1994. The faint clicking sounds on the first tune are the F natural keys of the flute – your CD is not defective! On “Paddy Fahy’s,” played in the key of C, two “D” tin whistles are overdubbed to the flute. A Parisian gypsy waltz composed by Gusti Mahla (sometimes spelled Gousti Malla), one of the early gypsy guitar players. This setting comes from the playing of button accordionist Jo Privat. This set should really have been called “Richard Dwyer’s,” as it includes two tunes associated with that fiddle player from the well-known musical family of County Cork. I heard the first tune played by his brother Finbar. A beloved composition of Turlough O’Carolan, followed by a version of “Bobby Casey’s Jig” heard on the Castle Ceili Band recording mentioned earlier. The slow air was composed for “a special occasion.” “Callaghan’s” is a hornpipe Denis Murphy used to play. I heard “The Birmingham Reel” at various sessions, although I didn’t know the name of it until recently. “Roaring Mary” is in the landmark book O’Neill’s Music of Ireland.